My 2yo is potty trained! She is consistently dry night and day and wears underwear during the day. She announces every time she needs to use the bathroom and always wants company. She still has occasional accidents (only at home, usually outside) and is sometimes reluctant to use the potty if she needs to poop. I've been putting my third child on the potty since she was 5 months old. By 9 months she rarely pooped in a diaper and by 15 months she was also peeing in the potty more often than she was in her diaper. A couple of months ago, she was reliable enough that I packed up all the cloth training pants and all but a few cloth diapers (I still put a prefold and cover on her at night, just in case). For those who like to see the end from the beginning, here is a summary of my experience potty training my third child. You can find additional details about each stage in the process by clicking on the links to go to the individual posts. You can also find links to all my potty training posts on my Early Potty Training page. 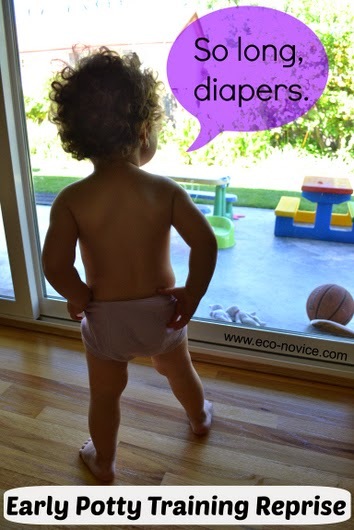 Baby spends some time diaper-free most days. I make cue sounds when she pees and poops and change wet diapers immediately. I put baby on the potty once a day first thing in the morning and more often than not she pees and poops. I continue giving diaper-free time and using cue sounds. She is often dry after naps or after being in the baby carrier. Baby pees and poops in the potty first thing in the morning almost every single day. She immediately begins to strain as soon as I put her on the potty and obviously associates the potty with elimination. I rarely have to change poopy diapers. Baby continues to pee and poop every morning. I put her on the potty after naps (she often wakes up dry) and at other times of the day if I feel like it. I often go a week without changing a single poopy diaper. My 9-month-old pees and poops every morning and sometimes wakes up completely dry (after 10+ hours and several sessions of night-nursing). She consistently uses the potty three times a day: first thing in the morning and after her two naps. There are also many times during the day when I know she probably needs to use the potty but I don't have time to put her there. I almost never leave her diaper-free now because she is too mobile. My one-year-old reliably uses the potty when she wakes up in the morning and after her two naps. She will pee many more times on the potty if we put her on it. One day I realized around 5 pm that she was still in the same diaper I'd put her in that morning. We went through a brief period where she resisted sitting on the potty even when I knew she needed to go, like right after a nap. But I could always get her to sit down by reading one of her favorite books. My one-year-old has probably pooped less than three times in her diaper in the last three months. My toddler goes in the potty many more times per day than she goes in her diaper and I feel like we are in the home stretch. In fact, occasionally she exclusively uses the potty for an entire day (no wet diapers). However, then there are the days when she refuses to sit on the potty and then wanders off diaper-free to the living room and pees a huge puddle on the floor. If there is one term I would use to describe this period it is Hit and Miss. It's mostly hit, but the misses tend to be fairly annoying and memorable. In general, I am noticing that my 15-month-old can hold it for longer and longer periods. We are lacking in a consistent form of communication with respect to the potty. So instead success is really about us taking her at regular and predictable intervals. Dry nights seem to be a thing of the past since she switched to one nap. I don't keep track of how many times she uses the potty any more. I think more in terms of misses or accidents. I'd say she averages 1 or 2 accidents a day. Occasionally no accidents. Often one or two. And sometimes 3 accidents during a 1-hour span. At times she can be very defiant about using the potty. So I guess I kind of think of her as a toddler who uses the potty but has lots of accidents. I switched to using Imse Vimse training pants almost all the time during the day. My toddler does now frequently announce "pee pee!" before she actually pees, but she certainly doesn't do this all the time. One new challenge is that my toddler's poops have gotten less frequent and much harder, making pooping a much less pleasant experience for her. Often I find that she is refusing to sit on the potty because she needs to poop but doesn't want to. My toddler is always dry in the morning and after naps. She regularly announces that she needs to pee and poop and then goes to the bathroom with me. She has used a toilet in a public restroom (with my assistance, of course) several times. She almost never has an accident outside of the house. She has taken off her underpants and used the potty by herself (although this is still an infrequent occurrence). She still has accidents regularly (2 to 5 times a week) mostly while playing outside or because she doesn't want to poop. We are using a combination of training pants during the day. My 2yo is consistently dry night and day and wears underwear during the day. Even though she is consistently dry day and night, I still put a prefold and cover on her at night, mostly for my peace of mind. But I think she's peed in her overnight diaper only one time in the last several months, despite illnesses and plenty of random night wakings. We also still use cloth wipes, and I try to remember to wash them once a week. The wipes are usually the only item in my laundry load of "diapers." She does have occasional accidents during the day. Mostly little drips but one or two big accidents (while outside, so no big deal for me) in the last couple of months. She still often shows reluctance to use the potty when she needs to poop, but we have made lots of progress in the constipation department with a few adjustments to her diet: mainly, hummus! I am making a two-cup batch of hummus about once a week. Luckily, it only takes me 5 minutes to make even though I make hummus from scratch using dried garbanzo beans (not canned). She often eats it straight with a spoon. My 2yo announces whenever she needs to use the bathroom and usually wants me or Papi to come with her, although she can be coaxed into going by herself or with a sibling instead if necessary. She can take off her clothes by herself, but I often help her get them off to speed things along (she usually waits to use the potty until things are pretty urgent). I also help her put her clothes back on afterwards if I can (she enjoys running around half-naked - I prefer she not). She is usually willing to use the potty when prompted, before outings, bedtime, etc. She enjoys using a variety of toilets (toilet with potty seat, toilet without potty seat, her little potty). I usually stay and read to her when she is pooping because she seems to need the moral support. Well aren't you little miss lucky. Betsy, I need to channel you and your patience for pee & poop! We need some major remediation in the potty training department over here...what do you do with a child who just doesn't care about having accidents? I'm needing some inspiration! I'm actually not particularly patient. Definitely less patient than you are, Marcie! At least one of mine stopped using the potty almost all together though, and I'm trying to remember what I did. One approach is to ignore it for a week or two -- try to react as little as possible. Sometimes it's just about the power struggle. The opposite approach would be to just try to schedule 5 or 6 potty trips per day regardless of accidents. Depending on the age, you could use rewards -- I'm definitely not opposed to that. I usually use a small treat with the littlest ones. I also usually took my kids to the potty after accidents and changed their clothes there, often having them sit on the potty while I changed their pants and underwear. Hopefully I'll see you soon and we can chat about it.